I never thought of the word ‘peasant’ as a compliment, but to many people around the world it has become a badge of honour. I was unaware of the extensive literature that champions peasantry as an antidote to the distortions that globalisation and empire bring to farming. The first challenge is to define and distinguish peasant farming from what van der Ploeg calls ‘industrial’ or ‘entrepreneurial’ farming and its giant cousin, ‘corporate’ or ‘capitalist’ farming. The author insists that these differences are not simply those of size ranging from small and vulnerable (=peasant) through to large scale (=corporate) with the entrepreneur ranged between; rather, the differences can be described in clear patterns and attitudes that affect the land, the social networks, the work values, the attitudes to labour and machinery, and ultimately the quality of the food produced. The central thesis of the book is that the world is facing a highly centralised pattern of food production, processing and trading that operates on a global scale which the author calls Empire. While writing in a restrained and objective way, van der Ploeg clearly sees Empire as the enemy, as a destructive, coercive force that threatens human life. In this book, he traces the rise of new peasantries – a reassertion of family farms, local networks, farmer cooperatives, struggles for autonomy against the power of Empire. The peasantries described here are in Europe and in South America – very different but with clear similarities. They are based on three longitudinal studies (in Peru, Italy and the Netherlands) that span 30 years. In addition there is a stinging post-mortem on the rise and fall of the Parmalat food empire that spanned the globe in the ‘90s and crashed in 2003. The most important contention (contra many historians) is that peasantry is alive and well in modern agricultural landscapes. 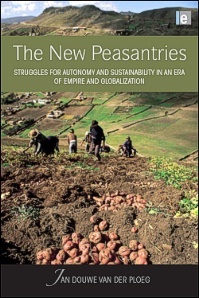 To persuade the reader of this, the author spends some time reflecting on the values that contribute to the peasant condition: while frequently in positions of dependency, marginalisation or deprivation, peasants are farmers who continually strive for autonomy, for improvement of productivity (through co-production with living nature), to get control of their own resource base, and engage in whatever non-agrarian activities and patterns of cooperation will assist them survive and achieve more autonomy. Well, who doesn’t fit into that category, you may ask? The big entrepreneurial agricultural enterprise has a completely different set of values. External capital provides big investment money for larger-scale production. The input into local community is minimal; the goal is to make a return. In fact, large scale often means a more wasteful use of resources and a larger production but with a very small margin – and the more that’s produced, the lower the price. On many occasions (we’ve seen this in our district), the entrepreneur realises that if making money is the goal, the stock market or some other business may do that more reliably and so moves on. The corporate global food empire is even worse. It adds nothing in the way of value or quality to agriculture but reorganises the chains of production and consumption to lock every player into their system, wringing as much profit out along the way to increase shareholder appeal. The tendency to Empire also defines the way governments perform when they regulate farmers, and the book traces the tragic anomalies, contradictions and dysfunctions that follow. The book then sets up these different paths and predicts that the entrepreneur, the industrial farmer and the Empire are unable to feed the world or sustain agriculture; the peasants will rise and win. But not before a lot of exploitation, pain and loss are experienced all around. From an Australian point of view, I found his description of the peasant principle very helpful and true, but its manifestation in our vast, thinly-populated and infertile land may look very different to the peasantry in Europe and South America where markets are immediate and populous. Closer settlement modelled on European models has repeatedly brought failure and bankruptcy through Australian history. In many parts of the country, farming populations continue to decline due to unsurvivable drought and we have yet to find a sustainable size and type of farming that will survive there. The depredations of Empire are certainly felt here with downward pressure on prices for produce, monopolised market access, and strangling regulations that deprive local communities from self-management of resources. Jan van der Ploeg’s remedy would see the farming districts uniting to form cooperative structures that wrest control of resources, production and markets back into local hands. Bring on cottage industries, farmers’ markets, local flavours and products, while side-stepping monopolies and lobbying against red tape. These are definitely the directions that I see it is important for churches and community-minded activists to push. Episcopal scholar-priest who is not ashamed of his "Anglican" heritage as it recovers the precolonial roots of Anglicanism. Imitating these Anglican roots Joe seeks the spatial privilege to be in the midst of radically opposing identities that disturb facile notions of unity resisting ideological notions of divinity. Founder of the Postcolonial Theology Network (PTN) on Facebook in Sept 2008; founder of Postcolonial Networks in February 2010 that includes the PTN website, the future postcolonial theologies-theories journal to be launched with Mario Aguilar Benitez at University of St. Andrew's within the next year and Widow's Mite, a foundation to enable cutting edge postcolonial scholarship (2011). The PTN initiates research networks around the world to produce high quality publications in disciplines that have historically not prioritized postcolonial research. Recent and future meetings include the first postcolonial Anglican critique of Church of England's mission of producing foreign parts (May 2008); bridging postcolonial theologies and theories in India (Jan 2010); developing a distinctive evangelical approach to postcolonial theology (Oct 2010); examine Edinburgh 1910 from a postcolonial mission theology perspective (Nov 2010) and integrate postcolonial and queer theologies and theories to honor Marcella Althaus-Reid, author of Indecent Theology (TBD 2011 with Mario Aguilar Benitez at University of St. Andrew's Scotland). Spouse-partner with Stefani Schatz, Episcopal priest and Rector of a large urban parish in Reno, Nevada. As busy as we are we share an evening meal four out of seven nights each week and enjoy cooking, travel and board games.